1. Broadcasting directly from IP camera. First of all, connect IP camera to internet. If camera doesn’t have static IP address, you should use dynamic IP. Some equipment manufacturers provide this technology, or you can use existing third-party services. Then go to Boomstream Live section and click button – Add IP-camera. 2. Url - RTSP link to video stream. 3. 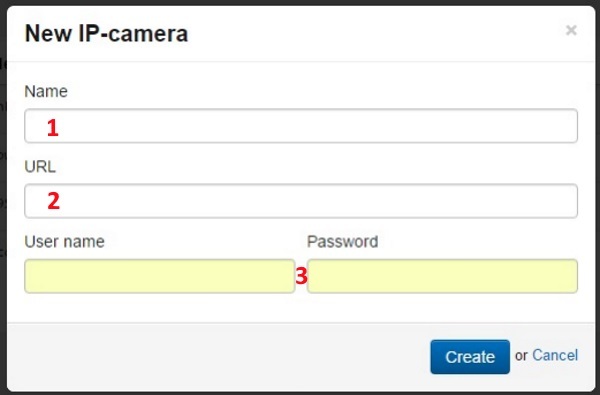 User name and Password – user data for getting access to your IP-camera. After adding new IP-camera, click on its name. 1. Camera status - Start/stop broadcasting. 2. Camera record – Start/stop recording. 3. Url - RTSP link to video stream. 4. User data for getting access to your IP-camera. 7. Statistics of views and duration of clips. 8. Information – here you can change name of live broadcasting; add description of live; add offline message. 9. Records – links to live broadcasting records. 2. Broadcasting from IP camera, using external programs. To redirect video stream from IP camera, use such programs as FFMPEG or Open Broadcaster Software (with installed plugin ip camera as video source). After installing this plugin, new source “Video” will be available. It’s necessary to write in source settings link to your video stream and click“+”. “Video” source should have check mark in list of sources. IP Camera broadcasts using codecs h264/AAC, if not, you have to transcode stream using keys (-vcodec libx264 -acodec aac). Keys are different depending from installed libraries.